Gene-Z is based on the technology used to identify cancer markers in the body. It has a microfluidic chip and a device to carry out and visualise the reaction, and is operated by an iPod Touch or Andriod-based tablet. The pathogen is swabbed off the plant tissue and placed on the chip. It is then inserted into the device, which performs genetic analysis and identifies the pathogen and extent of the disease. Some pathogens, however, require to be processed before they can be tested by Gene-Z. How would on-site identification of a plant disease help? 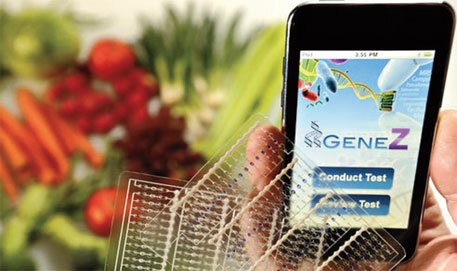 Identification of plant pathogens is cumbersome. It involves collecting field samples, sending them to a lab and awaiting the results. In some cases, many samples must be sent to the lab to zero in on the pathogen. The delay in diagnosis means delay in action or taking unnecessary action. A point-of-use device in the field can provide the results right away and help farmers take appropriate decision. We have proved the efficacy of the device by using it to detect downy mildew, a disease devastating cucumber crops in the US. But there are on-site diagnostic tools like microscopes. Microscopic identification does not reveal accurate information about pathogens. This is easily possible by gene-based identification. The microfluidic chip that we have developed detects up to 60 markers produced by a single pathogen. The chip can be customised to identify several pathogens. With multiplexing, it is possible to track many more pathogens simultaneously. Gene-based diagnosis also helps detect pathogen mutations, which is important to determine their resistance to available treatment methods. How fast and affordable is the diagnostic tool? If the extent of the disease is high, the pathogen can be identified in 15 minutes. With less abundance, it might take longer. Gene-Z is ready to be manufactured. The cost has not yet been finalised but it is a low-cost device.